The CRKT OC3 is an impressive, purpose-built knife. Columbia River Knife and Tool (CRKT) has added the OC3 dual-edged fixed blade knife to their impressive line of purpose-driven knives and tools. The OC3 features an impressive black powder coated 6-inch SK5 steel blade with a plain razor edge. The fiber infused polished resin handle provides the OC3 user a confident and secure grip in a variety of professional uses. Designed by well-known knife and survivalist writer Pat Cascio, the OC3 is specifically designed with the serious user in mind. Cascio holds a black belt in five different martial arts disciplines, and is a former Army officer and law enforcement officer. He has over 30-years of researching and writing on survival techniques and tools. All of this experience has gone into his OC3 design. 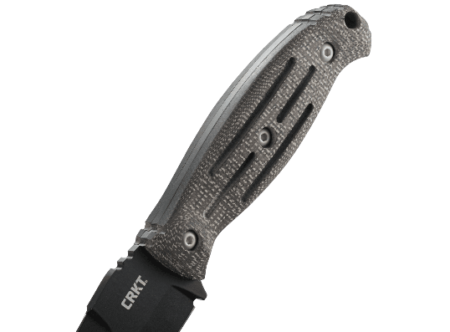 The CRKT OC3™ fixed blade tactical knife is a multi-purpose knife. The nearly 11-inch overall length, and 6-inch blade, place the OC3 in the category of serious and more professional use rather than and every day carry (EDC) knife. A dual-edged blade provides excellent cutting options. 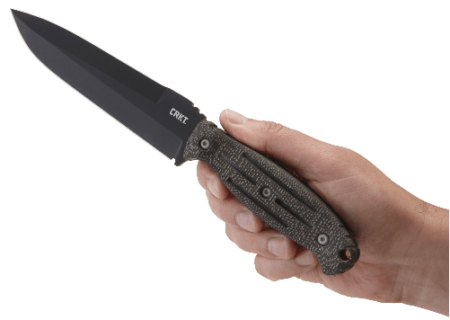 The dual-edge blade is significantly important and just one of the stand-out features of the CRKT OC3. Having a razor edge on both top and bottom of the blade, the user is provided a much greater opportunity to safely tackle cutting jobs than with a traditional edge down design. The OC3 user does not have to switch their master grip on the knife to cut through a variety of tasks, which is particularly important to professional users like law enforcement officers. 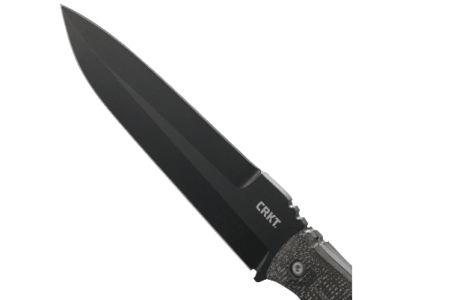 The CRKT OC3 blade is a full-tang design made with high quality SK5 steel with a black powder coating. SK5 steel is the equivalent of American 1080 steel, and is a high carbon/manganese combination. There are many reviews on SK5 steel reporting it is very durable, and keeps an edge just slightly less than the higher quality Carbon V (0106) steel. The black powder coating is chemically bonded to the steel to provide long-term corrosion resistance and overall blade protection. The glass infused Nylon handle gives excellent grip. The glass fiber infused polished resin handle is target designed to go the distance through a myriad of operating conditions. Designed to withstand both the elements and hard use, the handle also provides the user with enough texture to secure a grip during even the toughest jobs. The handle appears to be a good combination of natural lines for proper hand gripping, and enough texture for slip-resistance without being too aggressive. Secured to the full tang with three bolts, the handle also has slits along the length of the handle to help liquids disperse during use. There is a lanyard hole at the back of the handle should the user prefer to carry the OC3 in that manner. The glass infused Nylon sheath is a perfect combination for the OC3. Pat Cascio finishes off the CRKT OC3 with a glass fiber infused Nylon sheath. The decision to use a nylon sheath ensures long-term durability and moisture resistance. With a dual-edged blade, the glass infused nylon sheath is much better designed to hold the OC3 in a tight-fitting hold, over more traditional leather or cheaper polymer sheaths. The multi-position belt clip completes the OC3 package. The OC3 sheath comes with a multi-position belt clip, allowing the user to wear the OC3 as they see fit. This is another benefit of nylon sheaths over traditional leather sheaths. The sheath is also designed for pack carry with rivet holes and slots all along the outer edge. This allows the user several mounting options with 550 Paracord or similar material. The OC3 is designed to be a well-balanced work knife. Rivets and Slotted Carry Options. The CRKT OC3 is a very handsome knife as well. The CRKT OC3 appears to be a well-built, purposefully designed fixed blade knife with a lot of work options. The dual-edged blade is particularly interesting, giving the OC3 a great deal of versatility when cutting. The modified spear point tip provides excellent stabbing and piercing potential for survival situations. The BlueSheepDog Crew has recognized the impractical selection of most fixed blade knives for Patrol and Detective use. A knife like the OC3 cannot reasonably be worn on an officer’s duty belt, and I cannot see how a detective could justify its carry either. However, the CRKT OC3 could be an excellent selection for a bail-out bag (B.O.B.) for active shooter, or other critical incident response. 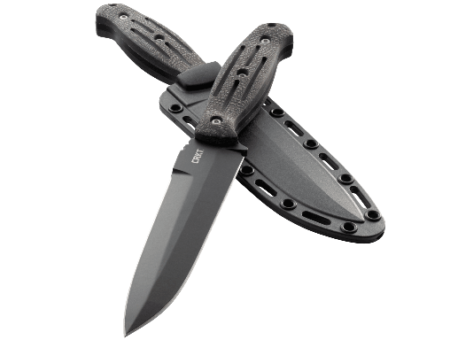 The OC3 would make a very nice SWAT or other Special Operations knife as well. Overall I’m very intrigued by the OC3 and so far very much like what I see. I’m planning on purchasing a CRKT OC3 soon, and I’ll let you know what I find. Until then look upon the OC3 and consider the opportunities yourself.